Traveling in style just got a whole lot easier! Nuna has put two of its most popular and highly regarded products together into one convenient travel system. The MIXX2 Stroller and the PIPA Infant Car Seat are now a perfect match! What's Included with the MIXX2 Travel System? The wheels on the Nuna MIXX2 have a new stylish black-and-chrome look and the front wheels are now larger in diameter (7.5”). Along with the tough, foam-filled rear tires and a one-touch rear-wheel breaking system, the Nuna MIXX2 is strong and responsive and ready to tackle any terrain in style. The Nuna MIXX2 folds easily and compactly with a quick-click lock that automatically keeps it from unfolding while you lift, to provide easy loading into the car or storage bin. It also converts easily into trolley form like a rolling suitcase, making it easy to fold, grab and go! Opening the Nuna MIXX2 is a snap with a design that allows you to easily unfold the stroller with one hand, making set up and go as simple as ever. The one-hand, five position plush knit stroller seat allows for easy adjustments as well as a full recline. The adjustable calf support with integrated footrest allows for plenty of space for the little one to sleep or stretch. Recommended use: birth to 50 lbs. Nuna has long been known for their thoughtful solutions and clever designs. The growing family of Nuna PIPA Infant Car Seats is no exception. As one of the most popular and well-designed car seats ever, the Nuna PIPA has been a game-changer in terms of car seat technology and innovative design. With the introduction of the new PIPA Lite and PIPA Lite LX to the family, Nuna has raised the bar yet again. Boasting a svelte new design, the new PIPA Lite has shed 2.6 lbs. 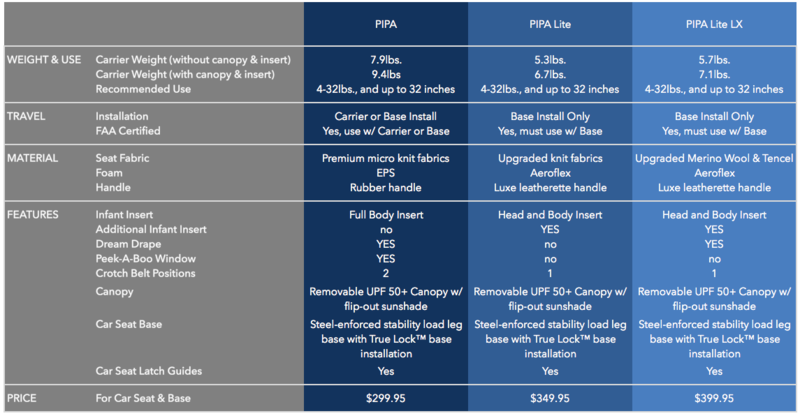 off the original PIPA and weighs in at an amazing 5.3 lbs., the lightest car seat currently on the market. The new PIPA Lite also features Nuna's Aeroflex Fusion manufacturing process which produces an extraordinarily flexible, lightweight, and safe outer shell. In addition the new Lite prides itself on having no added fire retardant chemicals in the fabric of the seat, provides upgraded premium fabrics, and included bonus organic cotton inserts and fabrics. In order to accommodate the additional features and the lightweight design, the new Lite does sacrifice the dream drape which is not included. Frequent travelers should also take note that the PIPA Lite carrier cannot be installed in a taxi or a plane without the base, unlike the original PIPA car seat. That means travelers with the PIPA Lite will have to take both the carrier and the base with them. The third sibling of the Nuna PIPA family to be introduced is the Nuna PIPA Lite LX. The PIPA Lite LX, while weighing just 0.4lbs. more than the PIPA Lite, not only brings back the beloved dream drape, but also offers upgraded merino wool fabrics. The Lite LX features a Merino wool and TENCEL lyocell fiber blend that’s naturally soft, controls moisture, and is environmentally friendly. Like the PIPA Lite, The PIPA Lite LX has no added fire retardant chemicals.